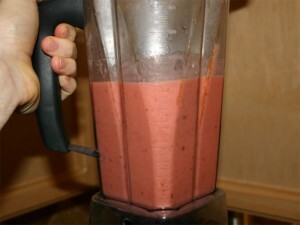 Now that winter is upon us (me that is), I don’t feel bad about using frozen fruits in my smoothies! Normally, I advocate using fresh fruits rather than frozen for the molecular structure of the fruit has not been altered by low temperatures. But when it gets cold outside, I like to bring back the feeling of warm season fruit in a way that warms me up. Nothing fits that bill better than Ice Cream! Ice Cream it is! At least for the first few seconds of the life of this drink. Well, ok, I give, it might not really be iced cream (diary), but it sure does taste like it. And, if it doesn’t, I keep working it until it does. Ultimately, I LOVE to experience great tasting smoothies, thus I’m always working to bring out the best flavors. So, here we go, a creamy strawberry surprise. When I did my shopping the other day I weighed the Swiss Chard before bagging it. Each bunch came in just under a pound. Yep, that’s right. I use the full bunch and get the biggest ones that I can find. 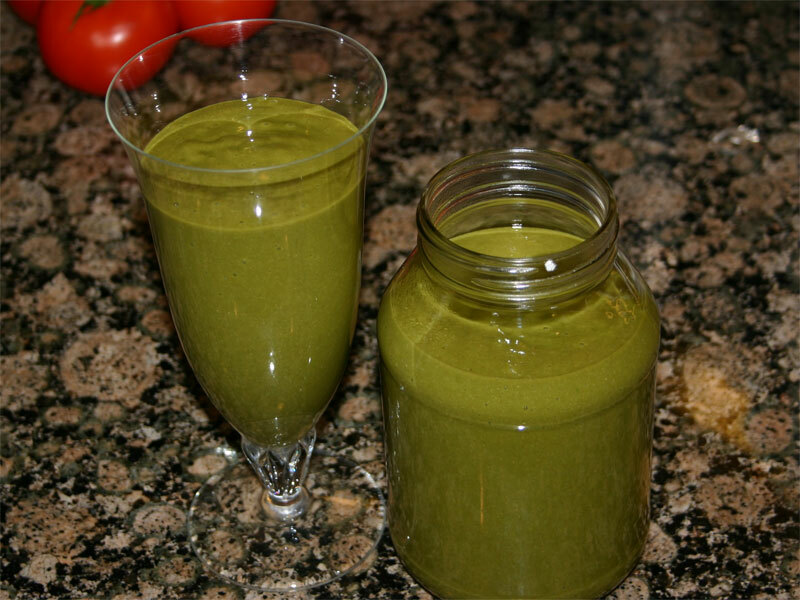 The green smoothies are all about re-mineralizing your body and sweeping out the toxins. So, even though you see all the fruit, it’s balanced by all the greens. If you were to look straight down on this, you’d notice that it’s more like a milk shake than ice cream. I probably should have added another few strawberries. That would have thickened it up. Never-the-less, it tasted like a strawberry milk shake – which was close enough for me. The next step is to grind the flax seed. I love this function for me coffee grinder. Since I gave up making latte’s, that little grinder had sat unused. Now, it’s my flax seed grinder and it works great. 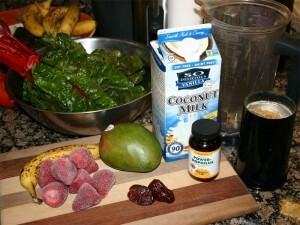 To the ‘milk shake’ I add the rest of the ingredients: ground flax, probiotic and Swiss chard. When I add the Swiss chard, I remove the main rib from the leaf. It’s got some great properties to it, but I don’t want anything in this drink that will distract from a smooth texture. Now blend. If you’re using a vita-mix, you’ll most likely have to use the plunger to get the greens broken down, but once you’ve got it spinning, flip it on high and give is a whirl. But don’t stop there! Because we’re using frozen strawberries, we can let the blender run longer and the heat is dissipated into the frozen fruit. And, because we get to let it run longer, we get a creamer feel in the end product. You won’t get a strawberry seed as you enjoy this one. Note that this makes about 6 cups! Ever wake up with the answer to a question you didn’t know you asked? It felt that way to me this morning. I awoke with the reason why people should not eat meat. It’s a really simple concept and it doesn’t involve the dreaded four letter word FEAR. It’s all about the body ridding itself of triggers what would have toxic side effects. If you haven’t noticed, I’ve been reading The China Study by T. Colin Campbell (and others) for a while and it was the last thing that I read before falling asleep. This book is all about the links between animal based proteins and common disease. The authors have done an amazing job taking a second look at scientific studies from a nutritional point of view. I highly recommend giving it adequate time (and I’m only half way through it) yet I’ve already drawn one connection that makes the reading all worth it. What does all of this have to do with what we eat? It so happens that the antigens that trick our bodies into attacking our own cells may be in food. During the process of digestion, for example, some proteins slip into our bloodstream for the intestine without being fully broken down into their amino acid parts. The remnants of undigested proteins are treated as foreign invaders by our immune system, which sets about making molds to destroy them and sets into motion the self-destructive autoimmune process. This is basically saying that there is a point during the digestion process where the intestines can absorb molecules and it is long before the amino acid level. This leads us too; when you eat, not only do you get the atomic acids that are the fundamental building blocks for life, but you get some of the ‘life’ of the previous animal too! In other words, the animal that you’re eating had to create protein complexes that it used for cellular life. Sequences of proteins that unlocked its DNA are now floating around in your biological system. As Dr. Campbell points out, the autoimmune system discovers these foreign protein complexes and replicates another protein to break it down. Now the real question comes to play – why? You remember reading through that book? If not, you can always revisit the lecture series that I blogged about a short while ago (Unlocking your DNA). One of the key things that Dr. Lipton demonstrates is that protein molecules perform functions within the body as stimuli and/or triggers. If you need a refresher, start at the fourth video for there he talks about primary and secondary stimuli and then leads into how the cell replaces the proper effecter for the stimuli by using the DNA to replicate the desired response protein. Dr. Lipton points out that when a cell doesn’t have the right response for a stimuli in the environment, the signal molecules unlock the DNA in order for the cell to create the correct response to handle the environmental signals. With this as background, let’s add the two together and see what happens. Some animal dies for our food. In that animal’s cells (just before and after death) there are an un-measureable number of complex (and simple) protein molecules that work as both the signal and response proteins for that animal’s cells. 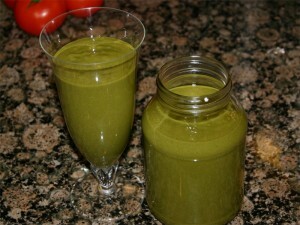 We than consume these cells in large quantities where not all the proteins are broken down to their basic amino acids. This means that both signal and response proteins could be floating around in the bloodstream triggering cells to behave in ways that the ‘brain’ (or central controller) never intended. As an emergency response to the float of signals in the bloodstream, the autoimmune system quickly replicates the ‘anti-molecule’ to inhibit the invasion of proteins. Yet, sometimes, because the animal proteins may be very similar to human proteins, the ‘anti-molecule’ ends up attacking a similar useful protein in the body (like the pancreas that causes type-1 diabetes). Also, if the autoimmune system can’t get to all of them fast enough, some of them may actually trigger the chain reaction on the surface of a cell that eventually causes some relatively dormant function in the cell to awaken and to successfully service the signal, some primitive section of the DNA gets unlocked and harmful proteins are reproduced to service the trigger. Said differently, when we consume protein molecules that were other animal triggers and responses, we end up introducing ‘foreign’ forms of life into our biological system. How those other life forms work and respond may not be aligned with what should be done for humans. What about plants? When you read The China Study, it’s pretty clear that the differentiating line is between animal proteins and plant proteins. Could it be that Mother Nature thought of all this ahead of time so as to make the signals and triggers different between animals and plants? Also, maybe our bodies are specifically designed to NOT break down molecules into their basic amino acid so as to allow for absorption of molecules like chlorophyll. Chlorophyll is so close to the form of Hemoglobin that it doesn’t make sense for the body to break it down all the way, but rather absorb it and let the body tweak it from one form to another. It would save lots of energy to not break something down just to have to rebuild it again. Also, the simple concept that plants take in animal waste and animals take in plant waste is a pretty good sign that the relationship is synergetic. So, what was the realization that I woke up with? It’s this, when we consume animal protein, because our system doesn’t completely digest all molecules, many different types of molecules enter the bloodstream through digestion rather than being released through our glandular systems. When this happens, our bodies respond through our immune system to remove the invaders before they do damage to the cells. Unfortunately, if the amount of animal protein is too high (or they enter the blood too fast) the defense mechanisms of the body can’t keep up and these proteins act upon our cells as if they would in the animal! This idea would seem to give more meaning to the phrase – you are what you eat! I remember when I first watched this being struck by the idea that it wasn’t just giving up animal proteins, but giving up cooking as well. This would make sense for when you cook Chlorophyll molecules, they break apart into molecules that would be absorbed, yet they would also be ‘toxic’ substances that the immune system would have to deal with. That is not the case when you go raw! At this point, it seems to me that when we cook food we denature molecules that the body expects to see in its natural state. Likewise, when we consume animal proteins, we willingly accept signal and response molecules that may or may not have unexpected effects on the body. Waking up with this understanding gives me a new perspective on what I eat! If it also does for you, let me know. Hi All, Wow! You know how every once in a while you come across something that really touches you deeply? Well, today, I got those feeling that warmed me up inside as if I’d found a long lost friend. YouTube is really amazing. When the camera was invented, I’m sure the person that put it together didn’t know they would actually be able to transfer the spirit of a person through time and space by recording the actions a few flickers at a time! I’ll keep it short and simply share. If you want more info about this video, please see Therese’s website or YouTube channel. Oh, can’t leave without saying that it didn’t take 20 seconds before I felt the good vibrations and knew it. The fact that a few seconds later she mentions gifting good vibrations just confirms what I felt. And don’t let her intellectually divert what you feel by transferring your attention to the chants! The gift she’s given has already been expressed via the purity of her spirit at the moment of recording the clip! Just reach out and feel what she offers unconditionally! I love it when I stumble across videos like this one about making coconut oil. When I get a few minutes alone with the TV, I have the tendency to switch the channel to the How It’s Made show. I don’t think I’ve ever been disappointed with what they have to offer, yet I wish they’d go into a little more detail. When it comes to making edible oil, I would suspect that no one that I’ve ever met has any idea how to make it. And, they wouldn’t have any reason for they’d simply go to the store and pay the 10-15 bucks for the jar! It’s cool how the video takes you through all the steps. The grinding looks pretty aggressive! I wonder what that looks like for the camera really doesn’t pick up the image very well. The presses are pretty old fashion. Reminds me of making apple cider as a kid. The part that I didn’t know, was that when you press the nut, the juice will separate into three layers: skim milk, oil and protein. There’s a great show of it @ 5:04 in the video. I’ve ground and strained coconut flakes and it separates almost like this, but my kitchen (blender) is nothing like this operation. Looks like there was a related link that’s a little more ‘local kitchen’ than the previous one. This is John, from OkRaw.com showing us how to make coconut oil from everyday mature coconuts. I wish I could find the first video, but he does a good job summing up the first steps to the process. I would guess that he got a really good deal on coconuts, opened them, ran it through the juicer to make pulp (removing the juice) and then the video picks up at the oil extraction process. It’s too bad that he doesn’t show the final product after it’s separated. Now I know that I’ll be keeping my eyes open in a search for a great deal on coconuts. I’m looking forward to (at least) trying this process. I’m sure, if nothing else, I’ll gain a better appreciation for the price of a jar of coconut oil! Choose your words consciously – and may your spirit manifest harmony. I keep coming around to the notion that when you believe something to be the truth, the subconscious mind acts as if it really is the truth. This concept stood out strong after reading The Four Agreements by Don Miguel Ruiz a few months ago because he goes into this concept in great detail. The basic example goes something like this: If you believe what someone tells you, your body (and mind) respond in physical ways that go to support that belief. In other words, upon accepting that new truth you’re Being starts to resonate with the energy of that statement as if its truth. Even when you don’t put conscious energy into living up to that new truth, your subconscious mind will take care of that task for you. It’s really amazing how thorough the subconscious mind is when it comes to fulfilling your every desire! … We can actively choose how to respond to most environmental signals and whether we even want to respond at all. The conscious mind’s capacity to override the subconscious mind’s preprogrammed behaviors is the foundation of free will. From Dr. Lipton’s point of view, (which has strong roots in cellular interactions), a thought or belief is a stimuli for the cells regardless to whether it’s true or not. Once the stimuli are produced, the cells react. It’s really that simple. … Yes, perception “controls” biology, but as we’ve seen, these perceptions can be true or false. Therefore, we would be more accurate to refer to these controlling perceptions as beliefs. So, what it really comes down to is: Do you believe what you’re told? Or do you seek the truth for yourself? One of the most beautiful things about human Beings is that we have built in feedback systems that allow us to discover truths for ourselves. Some people believe that the systems are subtle, but I’m learning that they are a whole lot more dynamic than people give them credit for. In my experience, the number one feedback system is emotion! There’s no faster way to know if something is right for you than to listen to how it makes you feel. Likewise, there is no better way to determine if what you’re doing is right (or wrong) than to pay attention to the emotions that you feel when you’re doing it. If those emotions make you feel good, the actions that you’re doing are most likely in harmony with your spirit. Those actions are most likely in harmony with the environment too. What does this speak of truth? Well, if you’re body (and mind (read: ego)) resonate to some statement that is not in harmony with the truth (as you know it) you can feel this emotional affects as dis-ease. The sensation is similar to the sensation you ‘hear’ when tuning an instrument. The energy needed to maintain the statement gives off vibrations that are either in tune with the spirit of your Being or not. If you ‘feel’ the discord, then focusing specifically on the ‘root of that instrument’ will allow you to find a way to either tune it up or discard the statement as being inharmonic with your Being. As we know from previous studies (Is my current belief system serving me? ), everything that we’ve come to know of as being physical – hard – matter is really invisible energy (soft). All this ‘matter’ resonates with life whether we pay attention to it or not. As we pull it into our immediate environment (consuming it) we’re empowered by its vibration or hindered by its discord. If someone is not sensitive enough to feel the individual vibrations, they can still observe the affects that it has on the body (human system). Finding harmony in yourself is a great way to enhance your sensitivity to emotions. With a little practice and conscious observation (of the feedback) you should be able to discern what it is that is in harmony with your spirit and what is not. Ultimately, you choose what you are and how you want to be. At any moment you can re-analyze any statement that you carry around as truth to see if that truth is one that you want to continue to resonate with (identify with). If you find that the statement is not truth, it will fall away. Things that were once truths don’t always have to be truths. Find the truths that resonate strongest with you and experience those! Consciously choosing to not carry around inharmonic truths is the fastest way to living in harmony with yourself. Listen – do you feel that harmonic vibration?